Every now and then I see something that I think is worth sharing, and while it may not be anything to do with Digital Marketing or Marketing at all, I figure why not! 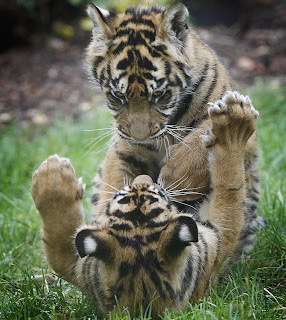 Last May two Sumatran Tiger cubs were born at Dublin Zoo. Finally, following a nationwide competition that drew hundreds of entries, the cubs again find themselves in the spotlight with the announcement of their names. “Emas”, which is Indonesian for “Gold”, is the name that has been chosen for the male cub and “Wanita”, meaning “Woman”, for the female. Interestingly the cubs father, Kepala, has taken an active role in the cub’s upbringing which is quite unusual as male Sumatran Tigers are traditionally solitary creatures. In another unusual twist, the family enjoy sleeping together at night alongside each other. Sumatran tigers are a critically endangered species with fewer than 400 alive in the wild. Dublin Zoo plays a significant role in the international breeding programme which is designed to ensure the survival of tigers in their natural habitat. As well as contributing to this breeding programme visitors to Dublin Zoo have the opportunity to support these critically endangered species by purchasing a Tiger adoption pack at Dublin Zoo gift shop. The following video is an interview done by Darragh Doyle back in July with one of Dublin Zoo's keepers, Anita, about the cubs.